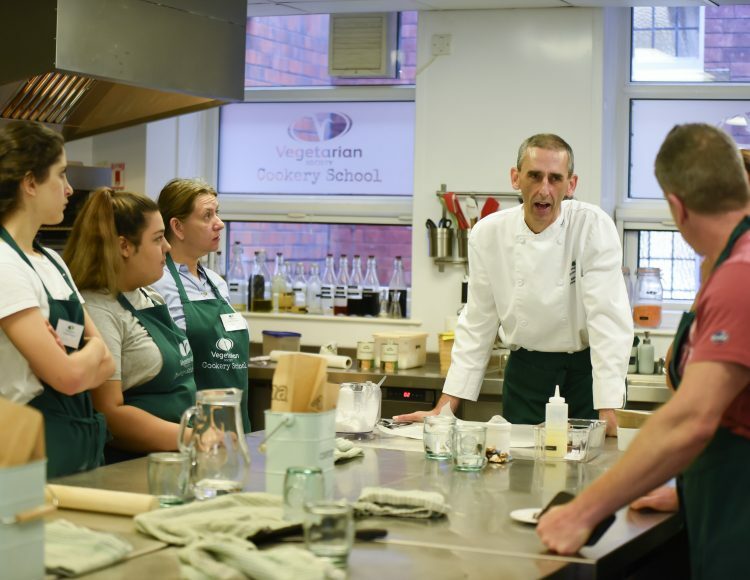 The Vegetarian Society Cookery School holds host to a number of highly knowledgeable tutors with years of experience in teaching, nutrition and the catering industry. You can find out more about them below. 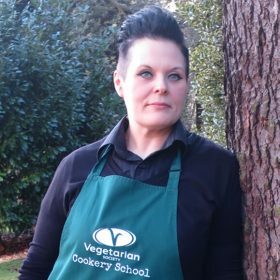 Life-long vegetarian, now vegan, Sam, joins us as our new cookery school manager and brings with her a wealth of experience, having worked in the catering industry for over 15 years. 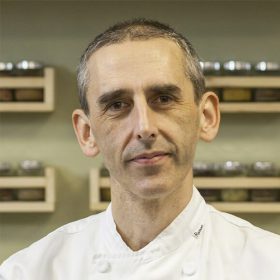 Principal Tutor, Alex Connell, has 25 years experience as a chef and a teacher under his belt, with the last 14 years spent working for the Vegetarian Society. The role is varied and Alex teaches, develops recipes and workshops, writes magazine articles and leads for the Vegetarian Society on food and cookery. He demonstrates great veggie dishes at events around the country and in 2015 lead a tour demonstrating to crowds in major UK cities. 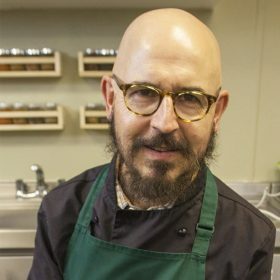 He has worked alongside such luminaries as the Hairy Bikers and Jay Rayner and has made numerous appearances on TV and radio. In his spare time, Alex has raised thousands of pounds for charity running marathons. Fiona has been vegetarian for nearly 30 years and vegan for the past year. 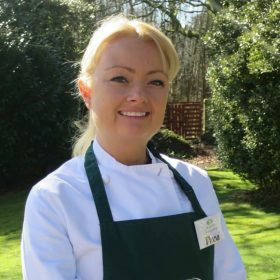 She has been a student on many of the Vegetarian Society Cookery School’s courses before successfully completing the Professional Chefs’ Diploma in October 2017. As a mother to two young children, Fiona enjoys using seasonal produce, that help her family glow from the inside and out! With more people enjoying plant-based food, Fiona’s courses show you where to begin and give you fresh ideas to experiment with at home too. Marie-Claire, (or ‘Maz’), teaches a range of world food courses, from Mauritian Street Food, to Thai and Viet delights. Her Mauritian roots and love of this tropical flavours were enhanced when she worked in a restaurant in Mauritius in her late teenage years. She tells us that Mauritian food is often made up of “simple discovery”, usually two to five ingredients, which have the wow factor when combined. It also takes influences from Creole, Indian, Chinese and African food. 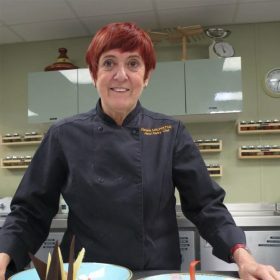 Having worked in the catering industry for over 30 years, the vast majority of her teaching has been vegetarian, and she now also teaches a day on our Professional Chefs’ Diploma. She has worked with big organisations, including the LGBT Foundation and Manchester University, and she has catered for the England women’s cricket team too. 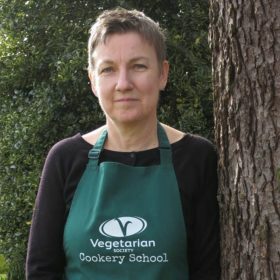 Lyn is already a familiar face around the Vegetarian Society Cookery School, having worked at the charity for over 10 years as a cookery school assistant. 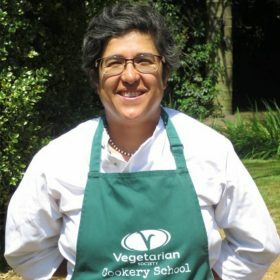 During her time at the Vegetarian Society, Lyn developed a passion for tutoring, completing the Professional Chefs’ Diploma back in 2006. For Lyn, a vegetarian for over 30 years, being able to pass on what she has learnt over the years is very rewarding. She will always make you feel at ease with her friendly and warm nature. Danielle currently teaches students to make jaw-dropping vegan desserts on our Professional Chefs’ Diploma. We thought it wasn’t fair that everyone else misses out, so now she runs The Vegan Dessert Guru, too! Her Belgian heritage has given her a love of good chocolate, and she has been a pastry chef around the Mediterranean, from Greece to Lebanon. After challenging herself to come up with a range of dairy-free desserts that beat the competition, Danielle decided vegan patisserie was her calling. Those who come on this course will discover how to make sweet treats look and taste as great as hers. Jonathan has been vegetarian for 36 years and vegan for the last 17. Having established vegetarian food and hospitality businesses, Jonathan has a strong interest in provenance and ethical food choices. He is passionate about helping students understand what goes on in cooking processes and the practical application of that knowledge to ‘free from’ cooking.